It seems a bit sniffy to be complacent about 4-0 victories but this was as routine as it gets. Liverpool needed all three points and got them with ease but Red Star Belgrade’s limitations at this level – despite their famous name – mean that this evening will fast fade in the memory. Despite the ground being packed to the rafters there is something missing, not least the presence of any away fans. Rumours that the Serbian’s Ultras would show up en masse in Liverpool regardless of their two-match ban come to nothing and the stadium is filled exclusively with Reds’ fans drawn mostly from the local area. Evertonians might still claim to be Liverpool’s “Peoples’ Club” but nights like this when over 54,000 show up in midweek make a mockery of such bravado. Have a look at any kickabout on Merseyside and for every lonely blue shirt there are ten happy kids in red. Tonight is one for our disenfranchised local youth, a whole generation seldom present at league fixtures, to get their Liverpool fix. Old stagers like me might have racked up a thousand games but for these youngsters getting into Anfield is still a treat; a chance to confirm their heroes are real and that football isn’t just a TV programme. If the club has serious intentions to develop Anfield further, the Boston hierarchy should have no apprehension about filling a bigger stadium and yet one suspects that such demand is less of a concern than maximising the financial “yield per seat”. Still there is a feeling that Fenway Sports Group are steady hand on the tiller, not fully in tune with the limitless potential of Liverpool FC. At Anfield on European nights traditions die hard and the Kop is once more a standing terrace; a place of community with a hubbub of conversation and mickey-taking even if the singing is meek and mild by comparison with bigger occasions. The fanfare of You’ll Never Walk Alone and the Champions League anthem still stir the passions but the atmosphere soon reflects that Liverpool are expected to win. The home crowd is at its best when tension and fear curdles the blood and Red Star are incapable of igniting any concern among the throng. I settle on watching Fabinho in the first half as though on a scouting mission. In the opening forays he’s most impressive for a pair of startling salmon pink boots but slowly we begin to see what the lad is about as he shows a real relish for a tackle. Every challenge is met with generous applause from the stands; the fans sympathetic to a restricted, slow start to his Liverpool career. As his confidence grows he creeps further up the pitch and begins to win the ball in areas where the Reds’ front three can prosper. With Fabinho advancing and Xherdan Shaqiri in perpetual, devilish motion there’s a novel and welcome fluency to Liverpool’s midfield. Shaqiri’s gorgeous pass sets Andy Robertson free on the left and his inch-perfect pull-back is gathered by Roberto Firmino on the penalty spot. Firmino neatly tees himself up with a couple of touches and his right foot before lashing home with his left. 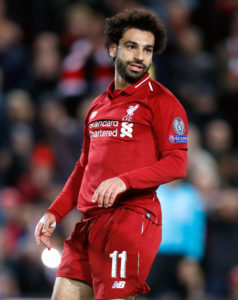 Before half-time Shaqiri cushions another deft pass into Mo Salah’s path and the Egyptian, gradually casting off his recent insecurities, blasts in a second that sweetens the pint at the interval. The second half is one-way traffic, interspersed with a growing cynicism from a Red Star side intent on damage limitation. When Sadio Mane is blocked in the Kop penalty area there are muted shouts for obstruction but referee belatedly points to the spot after seeing a signal from the official behind the goal. These superfluous little deputies must crave attention but rarely seem brave enough to intervene so it comes as no surprise that he gets a volley of abuse from the Serbs. Salah lays immediate claim and bags himself a brace; his rehabilitation gathering pace with each game. The referee reasserts his own authority by awarding a second pen for a dubious hand-ball but Mane crashes against the underside of the bar to an enormous groan from a greedy, already sated Kop. A final dollop to feast on comes near the end when Daniel Sturridge unselfishly slides Mane in to make amends with a toe poke beneath the keeper. The goals are met with polite applause in keeping with the acceptance the Reds have merely done the job against the whipping boys of the group. There will bigger and better nights to come in this competition. With Napoli taking a point in Paris, although Liverpool now top Group C, nothing is settled just yet. The return in Belgrade will be a feistier noisy affair than this, before the matter of qualification is settled in the Parc des Princes or back here under the lights when the Italians are in town.